Heat the coconut oil over medium heat. Add the onion, garlic, and ginger and cook until softened, 5-7 minutes. Stir in the spices and cook until they’re fragrant, about 1 minute. Add the chickpeas, tomatoes, coconut milk, and cauliflower. Increase the heat to medium-high and bring to a boil, then reduce heat to low, cover, and simmer for 15 minutes. Uncover and cook 5 minutes more, or until sauce has thickened slightly. Season with salt and pepper to taste and garnish each serving with cilantro. Although chickpeas and cauliflower can be difficult for sensitive Vata digestion, the coconut milk helps to balance the rough qualities. 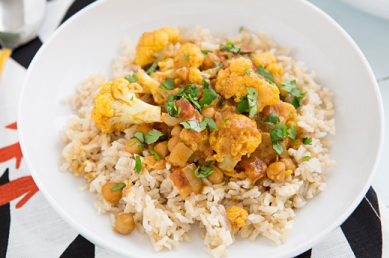 This dish is great for Kapha and Pitta and can be eaten in moderation by Vata individuals.